Does your company offer outdoor fireplaces? 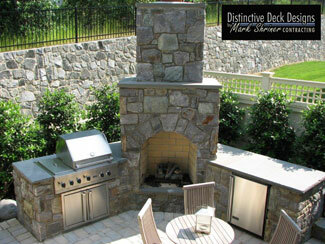 When it comes to incredible outdoor fireplaces, Fairfax, VA homeowners trust Distinctive Deck Designs. We build high-quality gas and wood-burning fireplace installations of all sizes to complement your existing backyard décor. Whether you are starting fresh or have an existing patio, our team of professional designers can work with you to develop a plan that suits your needs. Our design process includes a complete evaluation of your outdoor place, including available square footage. If you prefer a gas fireplace over traditional wood-burning styles, we will consider placement of your gas lines before drafting our design. We will then work together to decide on the materials, size, and style of your installation to ensure a finished look you can be proud of. Customize your fireplace even more with built-in seating to create a relaxing place for family and friends to come together. Homeowners throughout Fairfax love the finished look of our fireplace installations. This is a great way to gather the family for a family dinner by the fire or get your friends together and roast s’mores over an open flame. Properly built fireplaces are more than just a warm place to settle in for an evening; they actually add value to your home. A well-designed patio and newly installed fireplace add livable space to your home that is appealing not just to homeowners, but also to potential home buyers. These luxurious details are often the defining factors between your home and others on the market. 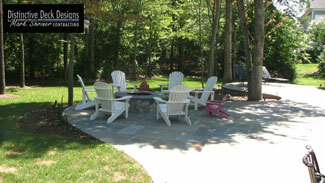 Distinctive Deck Designs combines the experience of northern Virginia’s foremost outdoor hardscaping experts. We have completed installations throughout Fairfax, Loudoun and Prince William counties. Contact us today to learn more about our services or to schedule your completely free design consultation.